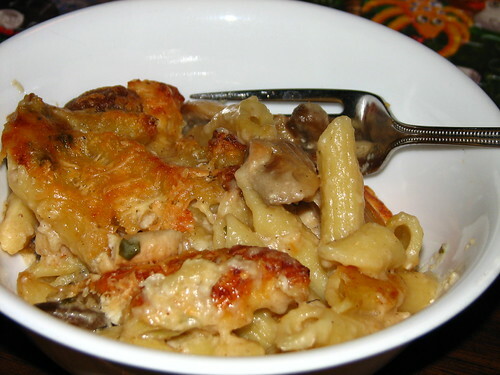 Last week, I made Baked Penne with Chicken for supper. It was delicious! The family loves it and wants to have it again. Soon. I changed the recipe just a bit, so am including my own version here. See Ezra Pound Cake for her version, which was the base for my own dish. I took a few shortcuts and saved a pan or two. She also included sun-dried tomatoes, but we were unable to find any in town, so I had to leave them out. I’m sure the tomato would add another delicious layer to the flavor. Preheat oven to 400 degrees F. Grease two shallow 2-quart baking dishes. In a large pot of boiling salted water, cook pasta al dente; drain pasta, and return to pot. 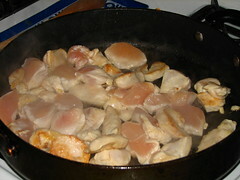 In a large nonstick skillet, heat a teaspoon olive oil over medium-high. 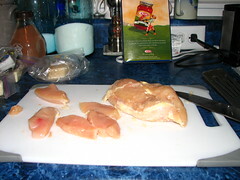 Cook chicken until opaque, less than 5 minutes. Put the chicken in the pot with the pasta. In the same large skillet, add a teaspoon of olive oil. 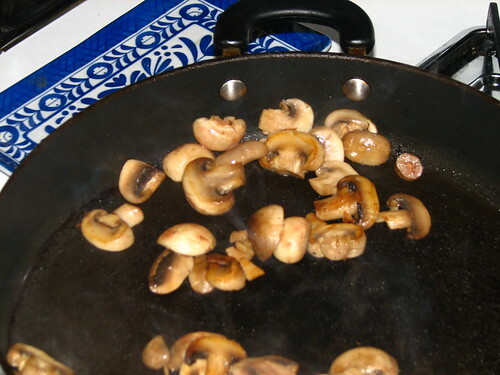 Saute the mushrooms and garlic until mushrooms are lightly browned. Add the mushrooms to the pasta pot. I didn’t clean the skillet before using it for the mushrooms. Use all those bits of flavor! 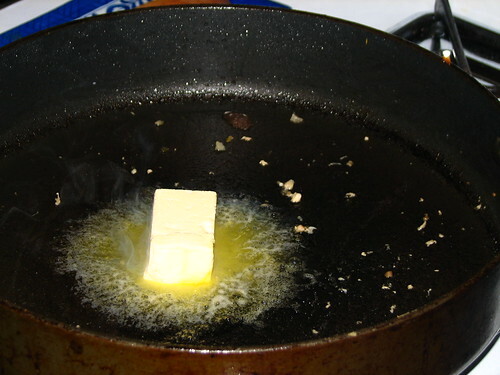 In the same large skillet, melt butter over medium. Add flour, whisking, cook 1 minute. Gradually add milk, whisking; bring to a simmer, whisking frequently. Season with salt and pepper. Cook until thickened. This will be a thin white sauce. Off heat, gradually stir in mozzarella, Asiago, and 1/2 cup Parmesan. Again, I didn’t clean out the pan before starting the roux. All those bits of flavor in the bottom of the pan will only add to the overall dish. Pour sauce over the pasta mixture and stir well. Divide the mixture between the two baking dishes. Sprinkle remaining Parmesan over the two dishes. Bake, uncovered, 25 minutes. Let stand 5 minutes before serving. 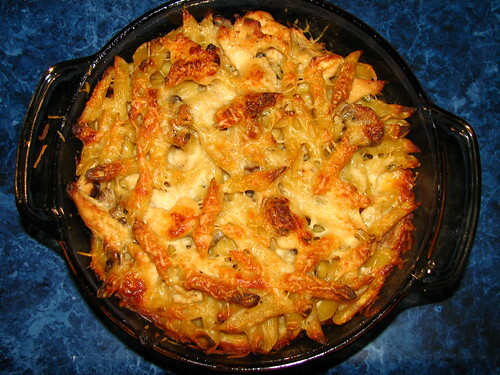 This entry was written by ~~Rhonda, posted on January 11, 2010 at 6:26 pm, filed under cooking, Recipes. Bookmark the permalink. Follow any comments here with the RSS feed for this post. Post a comment or leave a trackback: Trackback URL. I want some NOW!!!!!! Please ?